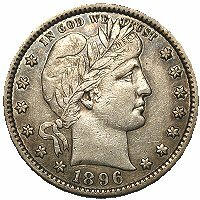 Although it is the #3 coin of the "Big 3," there are plenty of fake 1896-S Barber Quarters out there, most with added "S" mintmarks. Luckily, the coin is fairly straightforward to authenticate. There were only two pairs of dies used to make this date, and they have specific date and mintmark positions. The date and mintmark of any 1896-S quarter must exactly match one of the following two sets of photos. 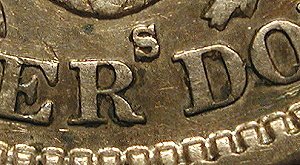 Note the squared, boxy shape of the "S" -- in 1898 it was replaced by a more rounded "S" and many fake 1896-S Barber Quarters use the wrong style mintmark. There are also some other diagnostics that can be used to detect even the best fakes, and these characteristics are described below. This reference uses the terminology found in The Complete Guide to Barber Quarters, 2nd Edition, by David Lawrence, one of the true Barber series experts of all time. 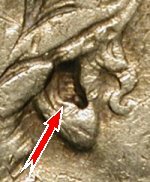 Obverse #1: The 1 is nearly perfectly centered over a denticle, and the 8 is centered over the left side of a denticle. 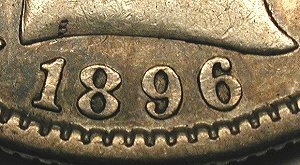 Reverse #1: The boxy-shaped S is above the tops of R and D, and is just slightly closer to D than R.
Obverse #2: The 1 of the date is centered over the right side of a denticle, and the 8 is centered over a denticle. Reverse #2: The S is lower (about even with the tops of the letters) and slightly closer to R than D.
In addition, it must be noted that both obverse dies became clashed with the reverse dies, leaving a series of horizontal lines within Liberty's ear (clashed from the horizontal lines of the shield on the reverse). On both sets of dies, this appears to have occurred early in the production run, as the majority of 1896-S Barber Quarters have them, perhaps as much as 75-80%. This seems to be unique with the San Francisco mint, as there are no known examples of 1896-P or 1896-O with these clash marks. 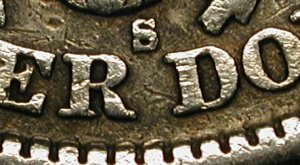 While one cannot dismiss an 1896-S quarter that does not have these marks (as they didn't all have them), any 1896-S coin with them is almost certainly genuine, and the clash marks can be easily seen, even on low-grade coins. Another diagnostic that can be used is the edge reeding. 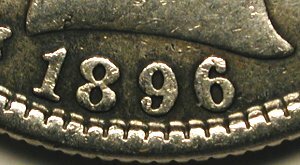 In 1896, the three mints used three different collars to impart the reeded edge, and the San Francisco Mint used finer edge reeding than either Philadelphia or New Orleans. As a result, any potential 1896-S quarter that still has the edge reeding present (usually VG or better) can be put side-by-side a P-mint coin and compared. 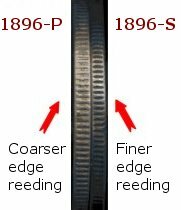 A genuine 1896-S Barber Quarter should have more edge reeds (less width for each reed) than the P-mint coin. If the reeds line up, then you have a forgery.